Germany has two coastlines, one facing northwest on the North Sea and the other facing northeast on the Baltic Sea. 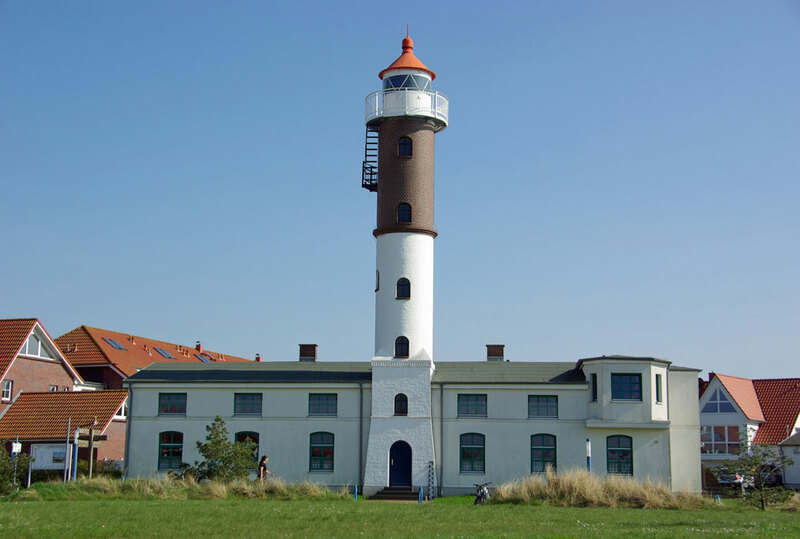 This page lists lighthouses of the Baltic coast in Mecklenburg, part of the state of Mecklenburg-Vorpommern. Before the creation of the German Empire in 1871 all of this region was part of the Kingdom of Prussia. From the end of World War II until the reunification of Germany in 1991 it was part of the German Democratic Republic (East Germany). Mecklenburg includes the western portion of this coast (the Wismar, Warnemünde, and Rostock areas), while Vorpommern (Lower or Western Pomerania) includes the eastern section from the Stralsund area to the Polish border. Interest in lighthouses is strong in Germany and most of the towers are in good condition. A federal law provides blanket protection to historic lighthouses. There is concern, however, that many of the lights may be deactivated in the coming years as navigators depend less and less on them. In German a lighthouse is a Leuchtturm ("light tower"), plural Leuchttürme. The front light of a range is the Unterfeuer and the rear light is the Oberfeuer. 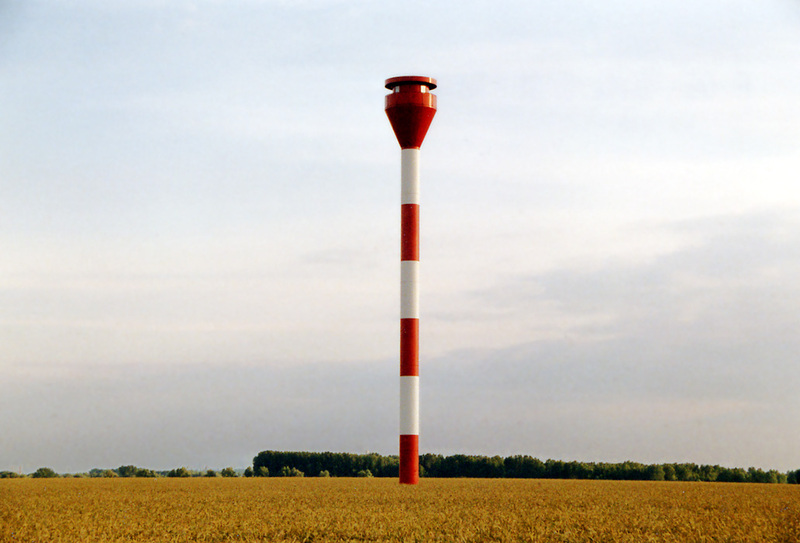 Modern range lighthouses are crowned by a topmark: a large, distinctive structure that serves to mark the range clearly in the daytime. ARLHS numbers are from the ARLHS World List of Lights. Admiralty numbers are from volume C of the Admiralty List of Lights & Fog Signals. U.S. NGA List numbers are from NGA Publication 116. 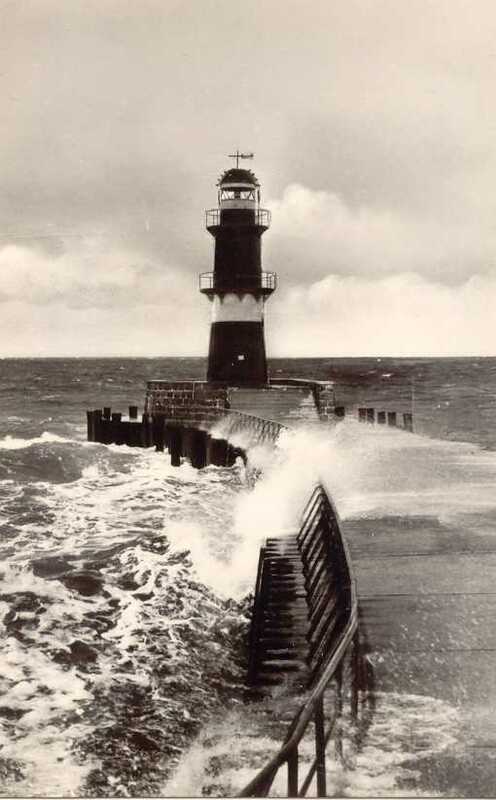 A large site with excellent photos and information on nearly all German lighthouses, maintained by Frank and Birgit Toussaint. Outstanding photos by Malte Werning. Photos of German Baltic Sea lights posted by Alexander Trabas. Photos and information posted by Erich Hartmann, a contributor to the Online List of Lights. This site has photos and information on many of the lights. Information on active lighthouses, with photos. Photos posted by Klause Huelse, who also has a page of historic postcard views. Germany's national lighthouse preservation organization. Navigational chart information for Germany. Note: These lighthouses are on the east bank of the Trave River opposite Lübeck. Date unknown. Active; focal plane 32 m (105 ft); white light, 2 s on, 2 s off. Approx. 25 m (82 ft) white skeletal mast carrying a triangular daymark, point up. No photo available but Google has a satellite view. The range guides vessels on the north-south reach in the Trave between Travemünde and Lübeck. Located in a forest on the northwest coast of the Teschow Peninsula. Site status unknown. Date unknown. Active; focal plane 42 m (138 ft); white light, 2 s on, 2 s off. Approx. 25 m (82 ft) white skeletal mast carrying a white rectangular daymark. A photo is available and Google has a satellite view. Located in a farm field about 300 m (0.2 mi) southeast of the front light. Site status unknown. Note: Wismar is a historic seaport about 45 km (28 mi) east of Lübeck. The capital of the Nordvestmecklenburg district, it has a population of about 45,000. 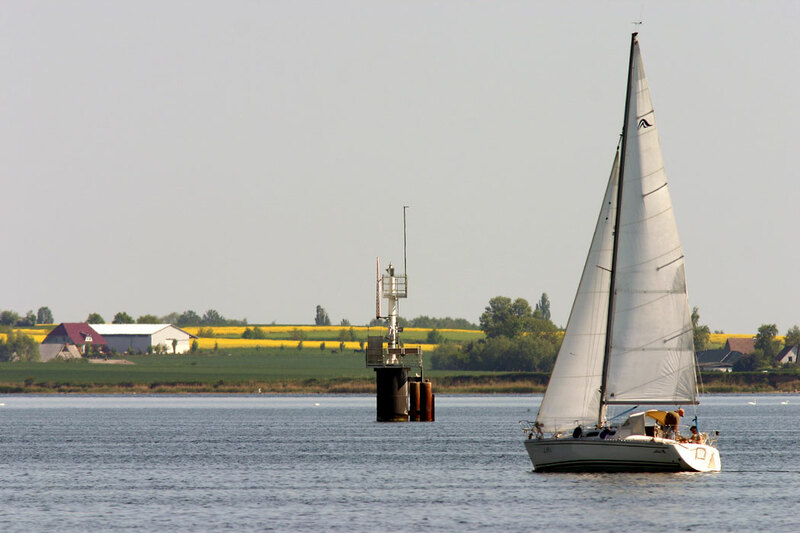 The approach to the port is through a series of ranges guiding vessels in the shallow Wismar Bay. Date unknown (station established 1938). Active; focal plane 19 m (62 ft); white light, 3 s on, 1 s off, synchronized with the rear light. 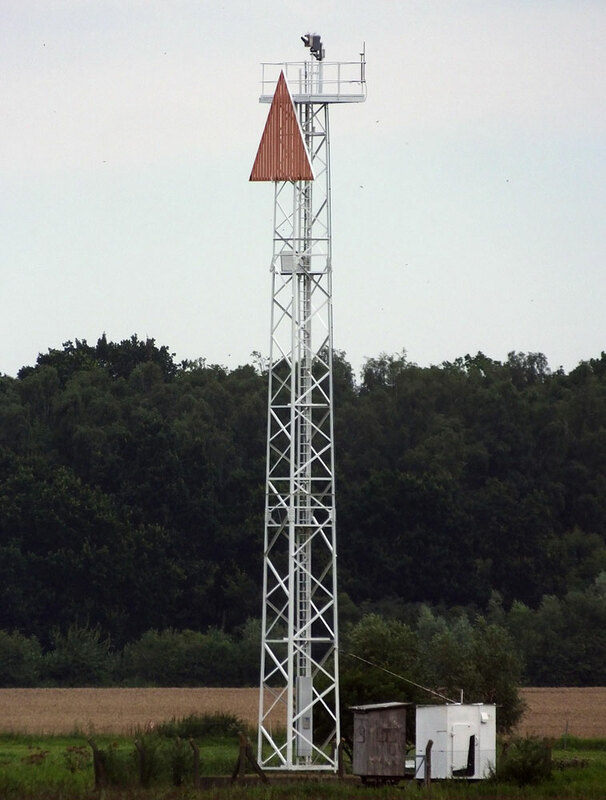 16 m (52 ft) square skeletal tower carrying a white triangular daymark, point up. Trabas has Gerd Liedtke's photo but Google's satellite view seems consistent with the June 2009 photo of a skeletal mast on Hartmann's site. This is an approach range for Wismar. Access to the light is through a golf course. Located on a point of land at Hohen Wieschendorf, about 15 km (9 mi) northwest of Wismar. Site status unknown. Site manager: Golfclub Hohen Wieschendorf. ARLHS FED- 356; Admiralty C1382; NGA 3316. 1971 (station established 1938). Active; focal plane 39 m (138 ft); white light, 3 s on, 1 s off, synchronized with the front light. 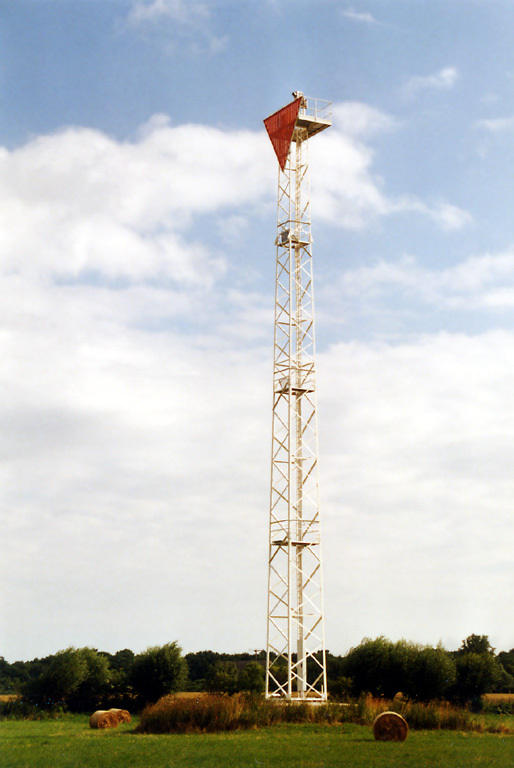 19 m (62 ft) square skeletal tower carrying a white triangular daymark, point down. Trabas has Gerd Liedtke's photo and Google has a satellite view. Located in the village of Hohen Wieschendorf, about 15 km (9 mi) northwest of Wismar. Site open, tower closed. Admiralty C1382.1; NGA 3320. Date unknown. Active; focal plane 28 m (92 ft); red light, 3 s on, 1 s off. 26 m (85 ft) slender square skeletal tower. Trabas has a photo and the shadow of the tower is seen in Google's satellite view. Located on the west side of the entrance to the Westhafen, an inner harbor basin of Wismar. Site status unknown. Admiralty C1392; NGA 3372. Date unknown. Active; focal plane 46 m (151 ft); red light, 3 s on, 1 s off, synchronized with the front light.43 m (141 ft) slender skeletal tower. Trabas has a photo and the shadow of the tower is seen in Google's satellite view. Located at the rear of the Westhafen. Site status unknown, but the tower is easy to see from nearby streets, including the Schiffbauerdamm. Admiralty C1392.1; NGA 3376. Date unknown (station established 1906). Inactive. 14 m (46 ft) cast iron lantern, watch room, and double gallery mounted on a short square skeletal tower; Fresnel lens mounted in the lantern. Lighthouse painted white; lantern roof is green. Werning also has a good photo and Google has a satellite view. 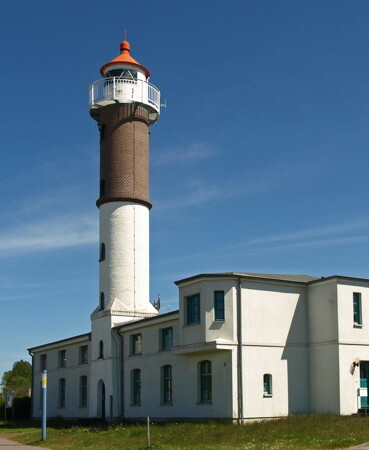 This lighthouse formerly stood in the Wismar Bucht south of Poel Island, carrying the front range lights for the inbound Walfisch range and the outbound Poel range. It has been relocated (fairly recently) for display on the lawn outside the WSA Lübeck district office in Wismar, a port on the southeast side of the Lübecker Bucht in the former East Germany. Trabas has a photo of the current Walfisch Unterfeuer. Located at the end of the Tonnenhofstraße, on the east side of the harbor entrance. Site open, tower closed. Owner/site manager: WSA Lübeck. ARLHS FED-250; ex-Admiralty C1387.8; ex-NGA 3344. 1872. Active; focal plane 21 m (69 ft); white, red, or green light, depending on direction, 3 s on, 3 s off. 21 m (69 ft) round cylindrical brick tower with lantern and gallery, rising from the center of the front of a 2-story brick pilot house. Building painted white, except that the upper 1/3 of the tower is unpainted brown brick; lantern painted white with a red roof. 3rd order Fresnel lens in use since 1931. A photo is at right, Werning has a good photo, Trabas has a closeup photo by Stephan Hix, Wikimedia has several photos, Marinas.com has aerial photos, Erik Habel has a street view, and Google has a satellite view. The tower was heightened in 1931 by the addition of an additional section, which was not painted and remains unpainted today, so that from the sea the lighthouse presents itself as white with a single broad brown horizontal band. Huelse has a historic postcard view of the tower at its original height. After the reunification of Germany WSA carried out an extensive restoration of the building in 1996-97; it was necessary to replace much of the brickwork in the tower. The lighthouse was also recognized as a protected historic site. 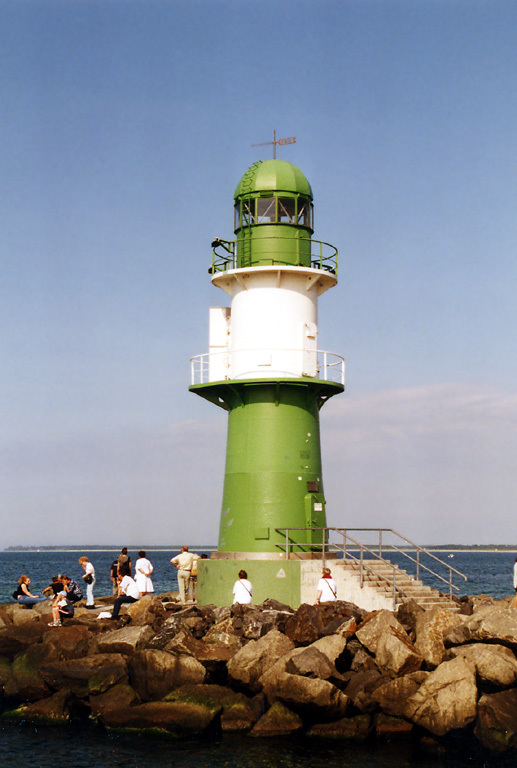 The lighthouse was repainted and refurbished in 2011, as seen in a photo by Rainer Lott and Steffanie Esch. Located on the waterfront in Timmendorf, a fishing port on the west side of the island of Poel. Site open, tower closed. Operator: WSA Lübeck. ARLHS FED-236; Admiralty C1386; NGA 3328. 1995. Active; focal plane 23 m (75 ft); white, red, or green light, depending on direction, occulting once every 5 s. Approx. 21 m (62 ft) triangular skeletal tower with gallery, painted white. Trabas has a photo by Ulrich Bode and Google has a satellite view. This directional light guides vessels leaving Wismar on a west to east jog in the channel. Located about 200 m (220 yd) west of the historic lighthouse (previous entry). Site open, tower closed. Operator: WSA Lübeck. Admiralty C1398; NGA 3330. 1953 (station established 1929). Reactivated (1996); focal plane 13 m (42 ft); white, red, or green light, depending on direction, 2 s on, 2 s off. 7.5 m (25 ft) square cylindrical concrete tower with square lantern and gallery centered at the front of a 1-story concrete keeper's house. The building is unpainted white concrete; lantern painted red. Larry Myhre's photo is at right, Leuchtturm-Atlas has a good closeup photo, Trabas also has a good closeup, Patrick Scholl has a 2011 photo, Werning has a good photo, and Google has a satellite view. The lighthouse shines a directional light over a very narrow arc to the north northwest defining the proper approach to Poel Island and Wismar for ships arriving from the Baltic. 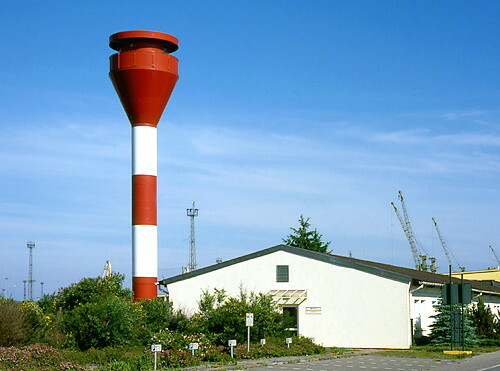 The DDR (East German) government built this rather plain lighthouse to replace the 1929 skeletal tower. In 1956 it became the front light of a range. Later the building was closed and the light was elevated onto a skeletal mast bearing a large triangular daymarker. Finding the building in poor repair after reunification, WSA Lübeck renovated it in 1996, removed the mast and daymarker and replaced the range with a directional light in the lantern. Located about 800 m (1/2 mi) west of the village of Gollwitz, near the northeastern end of the island of Poel. Site open, tower closed. Operator: WSA Lübeck. ARLHS FED-092; Admiralty C1398.5; NGA 3331. 1878. 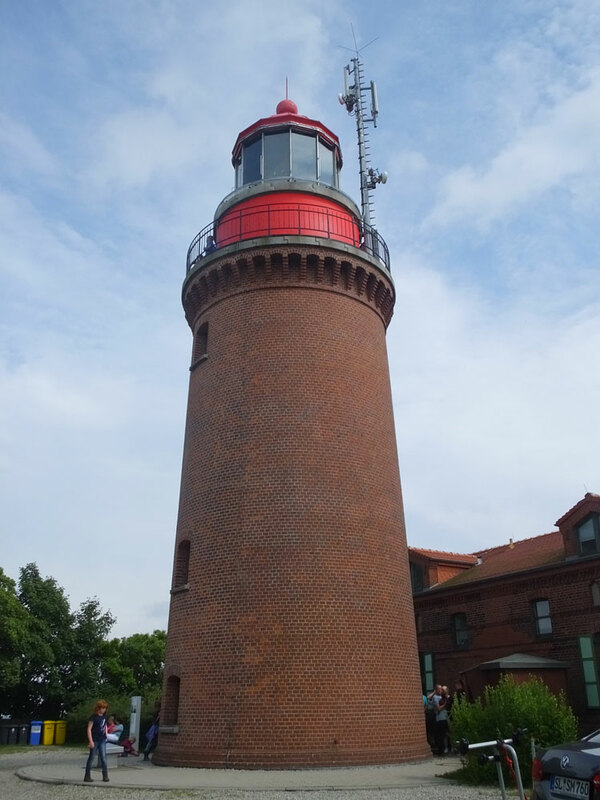 Active; focal plane 95.5 m (313 ft); four long (2 s) flashes, white or red depending on direction, separated by 7 s, every 45 s. 21 m (69 ft) round brown brick tower with lantern and gallery, connected by a covered passageway to the 2-story brick keeper's house. Original 2nd order Fresnel lens in use. Buildings unpainted; lantern painted red. Alexander Meins's photo is at the top of this page, Werning has a photo, Leuchtturm-Atlas has a great photo, Wikimedia has numerous photos, Trabas has a closeup photo of the tower by Capt. Peter Mosselberger, Huelse has a historic postcard view, Mike Henniger has a street view, and Google has a satellite view. Built by the former Grand Duchy of Mecklenburg-Schwerin, this lighthouse is a beautiful example of German Imperial lighthouse architecture and is recognized as a protected historic site. On Germany's generally low Baltic coastline this lighthouse is elevated above the sea higher than any other. Marking the eastern entrance to the broad Mecklenburger Bucht, it was built as the landfall light for Wismar and a guide for ships westbound for Lübeck. The tower was formerly painted red with a white horizontal stripe, but the paint was removed in 1993. WSA Lübeck restored the station in several projects completed in 1999 and has recently opened this historic lighthouse to the public for the first time. Located on a bluff about 1 km (0.6 mi) from the Baltic at Bastorf, near Ostseebad Kühlingsborn, about 65 km (40 mi) northeast of Wismar. Site open, tower open daily year round. Operator: WSA Lübeck. Site manager: Leuchturm Bastorf. ARLHS FED-058; Admiralty C1400; NGA 3412. 2010 (tower built 1998). 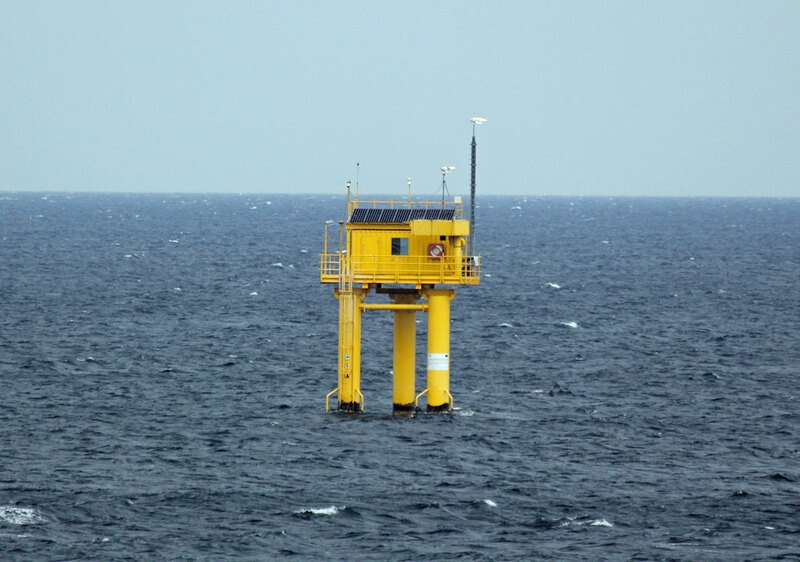 Active; focal plane 9 m (30 ft); five yellow flashes every 20 s. 9 m (30 ft) scientific station mounted on a platform supported by three piles. Entire structure painted yellow. Trabas has Hartmann's photo and Google has a satellite view. Operated by the state environmental agency, the station monitors an artficial reef created to improve fishing in the area. Located 1100 m (2/3 mi) off the beach at the resort town of Nienhagen, about 10 km (6 mi) west of Warnemünde. Accessible only by boat. Site open, tower closed. Owner/site manager: Staatliches Amt für Landwirtschaft und Umwelt Mittleres Mecklenburg. Admiralty C1403. Note: Warnemünde is a former fishing port and seaport for the city of Rostock 20 km (13 mi) to the south. Today it is primarily a resort town and ferry port; it also has Baltic Germany's main cruise ship terminal. 1898 (station established 1836). Active; focal plane 34 m (112 ft); four white flashes every 24 s in a 3+1 pattern, the flashes occuring at 0, 3, 6, and 15 s in the cycle. 31 m (102 ft) round tapered brick tower with lantern and two galleries, one at the top and one in the center of the tower. Tne tower is unpainted very light gray brick but darker brick was used to create a dark band on the lower half of the tower; lantern dome is unpainted green copper. Original 2nd order Fresnel lens in use. A 2012 photo is at right, Hartmann has a page for the lighthouse, Trabas has a good photo, Werning also has a good photo, Uwe Seidel has a 2016 street view, an article on the history of the station is available, Wikimedia has numerous photos, and Google has a satellite view. Huelse has a historic postcard view in which the lower half of the tower is painted white. 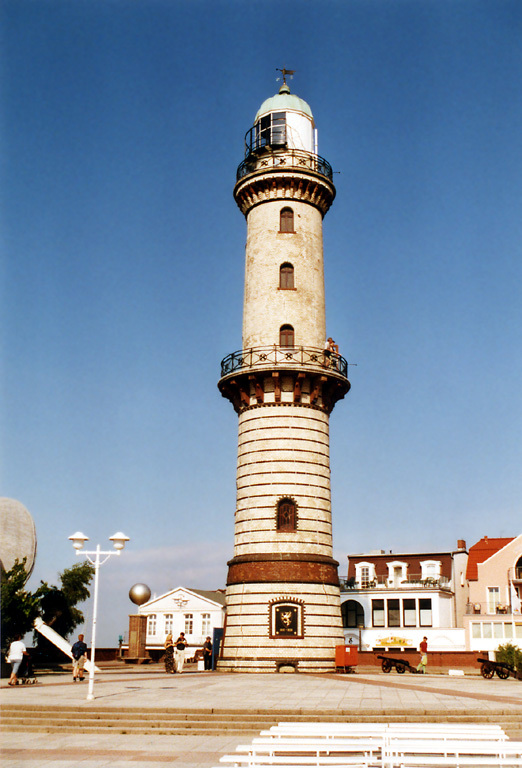 Lights are said to have been displayed at Warnemünde as early as 1348. In 1836 a light was shown from a scaffold atop a waterfront building. 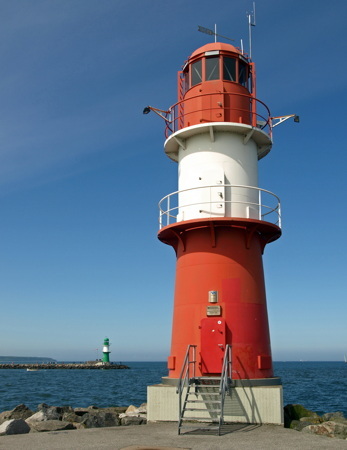 The present lighthouse is one of the best known landmarks of the Rostock area. After reunification the lighthouse was leased to a preservation organization for restoration and development as a tourist attraction. Located in a public square in downtown Warnemünde, about 200 m (220 yd) from the west bank of the river Warnow just inside the entrance. Site open; tower open daily Easter Saturday through October 1. Operator: WSA Stralsund. Site manager: Förderverein Leuchtturm Warnemünde. ARLHS FED-022; Admiralty C1404; NGA 3428. 1985 (station established 1877). Active; focal plane 14 m (46 ft); green light, 2 s on, 2 s off. 12 m (40 ft) round metal tower with lantern and double gallery, painted green with a white horizontal band between the galleries. Fog horn (Morse code "WN" every 30 s: short blast, two longs, pause, long, short.) Hartmann has a page for the mole lights, Werning has an excellent photo, Trabas has a closeup, Wikimedia has a photo of the two mole lights in action, Heinz-Willi Knechten has a street view, and Google has a satellite view. The lighthouse was relocated in 1998 onto a new arm of the west mole extending slightly to the east of the original mole ending. 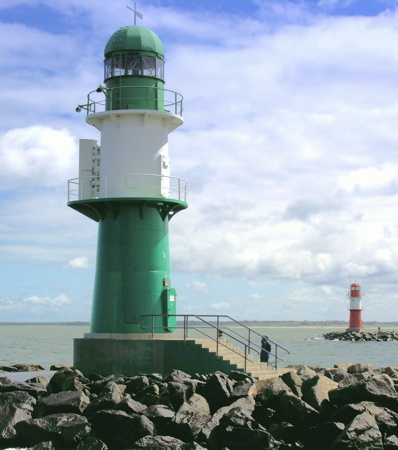 This lighthouse and its sibling on the east mole are known locally as Die Zwillinge (the twins). 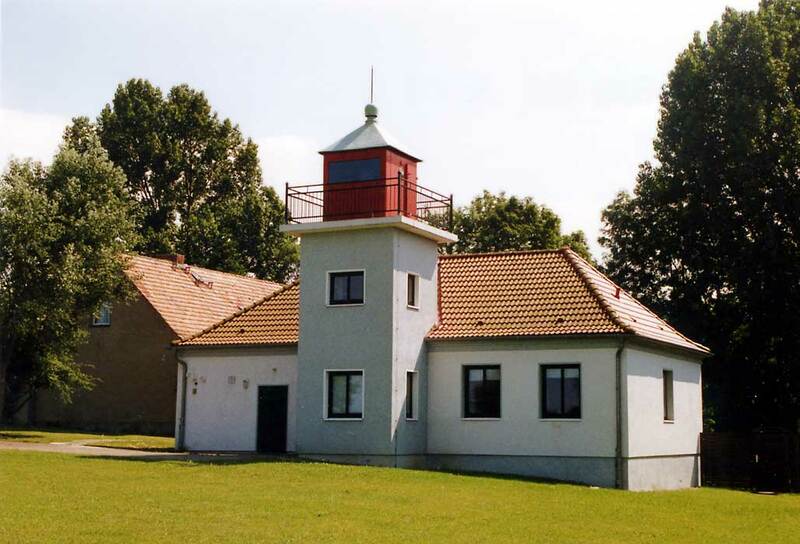 The 1963 lighthouse was relocated to a park in Rostock (see below). The history of the mole lights of Warnemünde is quite complex; both moles have been extended several times and there have been several lights on each mole. Michel Forand has a postcard photo showing the situation in 1959, shortly before the 1963 lights were installed, and another postcard view of the older beacons on the west mole. Located at the end of the west mole at the entrance to the river Warnow in Warnemünde. Accessible in good weather by walking the mole. Site open, tower closed. Operator: WSA Stralsund. ARLHS FED-258; Admiralty C1405; NGA 3452. 1963. Inactive since 1983. 12 m (40 ft) round metal tower with lantern and double gallery, painted black with a white horizontal band between the galleries. Wikimedia has a 2015 photo and a 2013 photo, Jenšíková has a photo (2/3 of the way down the page), and Google has a satellite view. Originally located at the end of the west mole at the entrance to the river Warnow in Warnemünde; it's not clear why this tower was replaced by an almost identical tower in 1983. Huelse has a historic postcard view of the light on its original station. 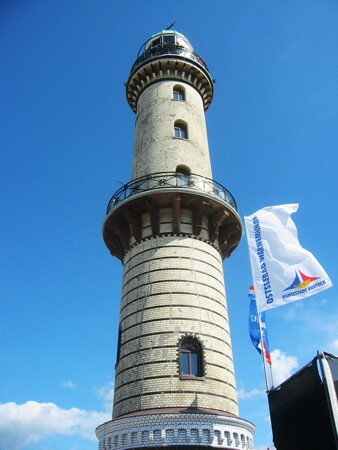 The older lighthouse was relocated for display in a riverside theme park just off the 105 expressway at Rostock-Schmarl, about 5 km (3 mi) south of Warnemünde. Site open, tower closed. Site manager: IGA Park Rostock. Date unknown. Active; focal plane 20 m (66 ft); white light, 2 s on, 1 s off, 5 s on, 1 s off. 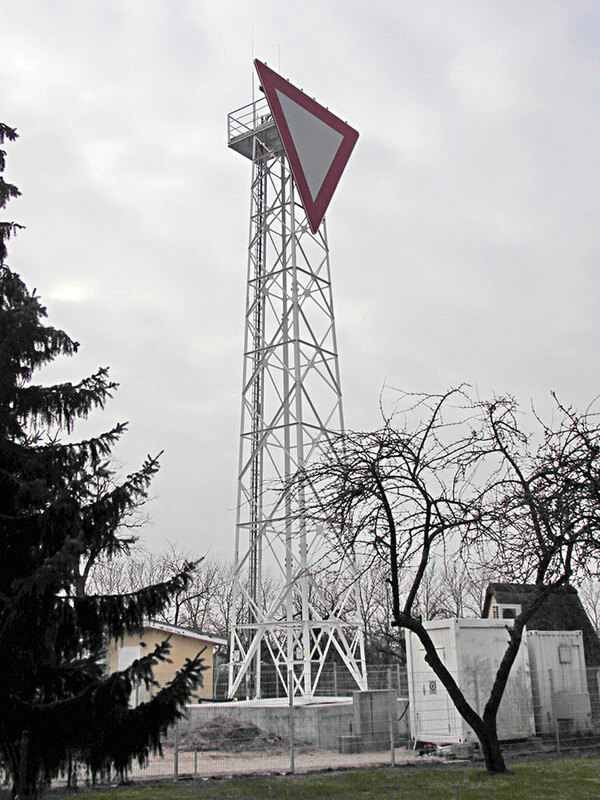 18 m (59 ft) square skeletal tower painted white and carrying a red triangular daymark, point up. Trabas has a photo, Michel Lazar has a street view, and Google has a satellite view. This range guides vessels up the river Warnow. 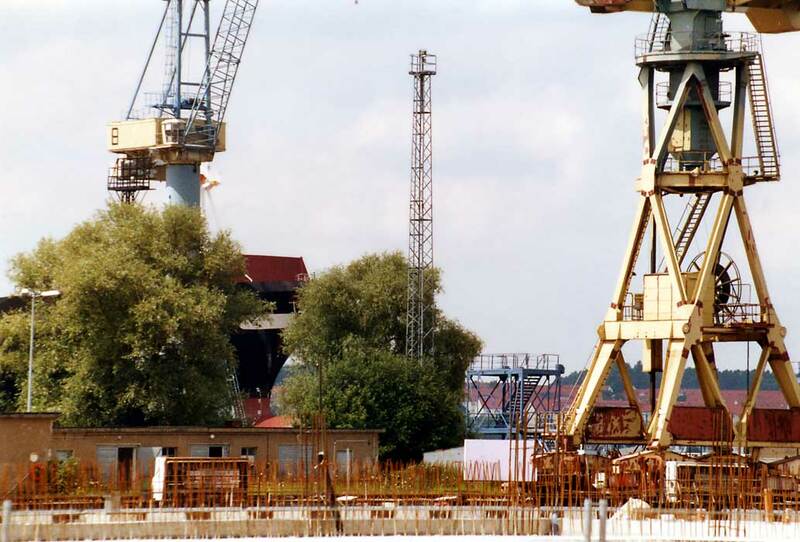 Located on the west side of the river just south of the Schiffbau- und Schifffahrtsmuseum Rostok. Site open, tower closed. Admiralty C1424.6. Date unknown. Active; focal plane 26 m (85 ft); white light, 2 s on, 1 s off, 5 s on, 1 s off. 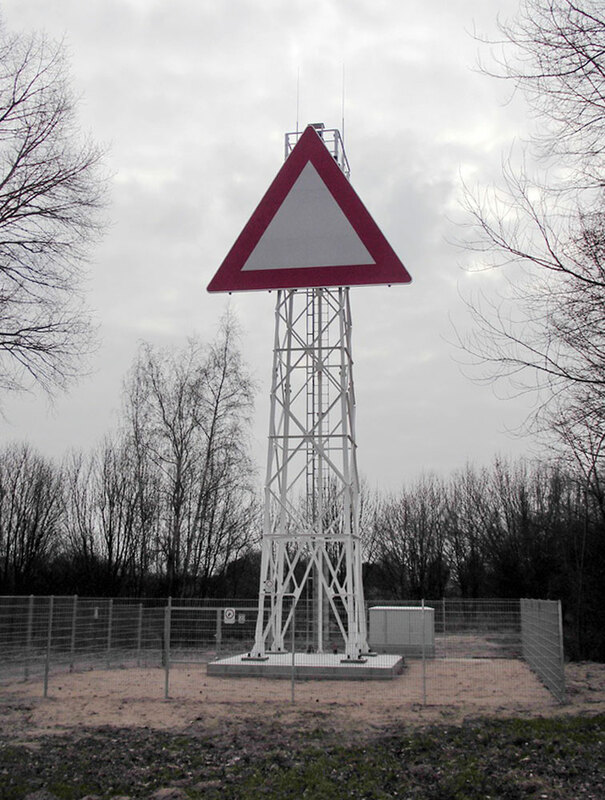 23 m (75 ft) square skeletal tower painted white and carrying a red triangular daymark, point up. Trabas has a photo and Google has a satellite view. Located in IGA Park, 220 m (240 yd) southwest of the front light and 150 m (165 yd) south of the relocated Westmole lighthouse. Site open, tower closed. Admiralty C1424.61. 1903. Inactive since 1963(?). Approx. 6 m (20 ft) round cast iron tower with lantern. Removed in 1998, the tower long stood derelict at the site of a former rail yard on the west side of the inner harbor. Wikimedia has a photo and Google has a satellite view. The abandoned and unprotected lighthouse was critically endangered. However, when Andreas Köhler visited in August 2017 he found that the lighthouse had been removed. 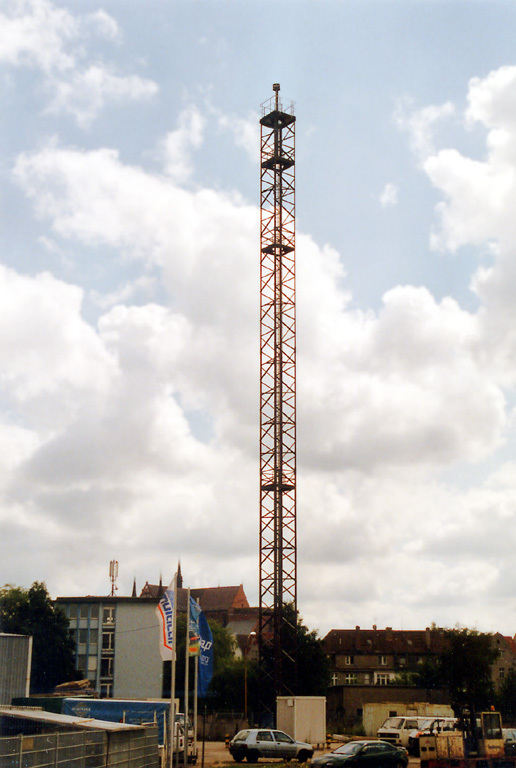 According to the Schifffahrtsmuseum in Rostock, the tower will be repaired and installed in a residential development nearby. Located across the tracks from the Werftallee on the west side of the harbor. Site open, tower closed. ARLHS FED-256. 1983 (station established 1877). Active; focal plane 14 m (46 ft); red light, 2 s on, 2 s off. 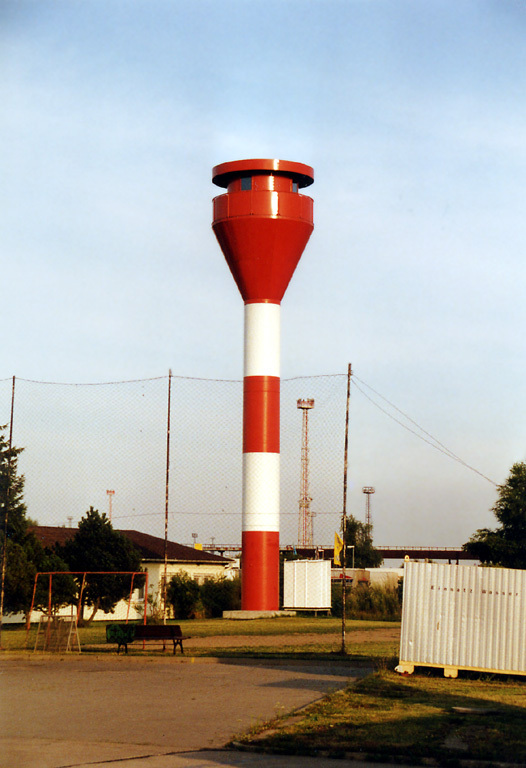 12 m (40 ft) round metal tower with lantern and double gallery, painted red with a white horizontal band between the galleries. A photo is at right, Hartmann has a page for the mole lights, Trabas has a closeup, Werning has a more distant view, Markus Birth has a street view, and Google has a satellite view. The lighthouse was relocated in 1998 when the east mole, originally quite short, was extended to the same length as the west mole. This lighthouse and its sibling on the west mole are known locally as Die Zwillinge (the twins). Located at the end of the east mole at the entrance to the river Warnow in Warnemünde. Accessible in good weather by walking the mole. Site open, tower closed. Operator: WSA Stralsund. ARLHS FED-257; Admiralty C1405.1. 1903. Decommissioned 1978. 36 m (118 ft) 3-masted steel lightship converted to a 3-masted schooner. Wikimedia has a photo, Georg Hoff has a 2012 photo and a series older photos is available. Built by Jos. L. Meyer in Papenburg and launched as the Außenjade, the ship served off the entrance to the Jade estuary until World War II. In 1945 it was sunk at its berth in Wilhelmshaven during a bombing raid. Raised and repaired, it returned to service in 1951 off the Elbe and moved in 1972 to the station TW/Ems off Emden. Sold after deactivation, it was converted to a schooner, painted white with a red "mouth" and renamed the White Shark. In 1999 it was sold to its present owners, who renamed it Sunthorice. Based at Rostock, it was available for charter and offers a variety of cruises. In the winter it was anchored at Flensburg for maintenance. However, no recent photos are available and the current status of the ship is unknown. Owner/site manager: Sunthorice e.V. ARLHS FED-305. 1999 (station establishment date not known). Active; focal plane 24 m (79 ft); red light occulting once every 4 s, synchronized with the rear light. 21 m (69 ft) round cylindrical tower with lantern and gallery arranged in a large funnel-shaped topmark. Lighthouse painted with red and white horizontal bands. Werning's photo is at right, Hartmann has a page for the range lights, Trabas has a photo, and Google has a satellite view. The Petersdorf range guides ships across the wide portion of the Warnow estuary to Rostock's new international port; ferries leave here for Gedser, Denmark; Trelleborg, Sweden; and various locations on the upper Baltic including St. Petersburg, Russia. Located at the head of Becken (Basin) B in Petersdorf, on the east side of the Warnow north of Rostock. Site open, tower closed. Operator: WSA Stralsund. ARLHS FED-309; Admiralty C1415; NGA 3432. 1999 (station establishment date not known). Active; focal plane 45 m (148 ft); red light occulting once every 4 s, synchronized with the front light. 33 m (108 ft) round cylindrical tower with lantern and gallery arranged in a large funnel-shaped topmark. Lighthouse painted with red and white horizontal bands. Hartmann has a page for the range lights, Trabas has a photo, Werning has a distant view, and Google has a satellite view. This lighthouse is similar to the large range light towers built on the Jade, Weser, and Elbe estuaries on Germany's North Sea coast. Located near Krummendorf 1250 m (3/4 mi) south southeast of the front light. Site open, tower closed. Operator: WSA Stralsund. ARLHS FED-310; Admiralty C1415.1; NGA 3436. 1984. Active; focal plane 25 m (82 ft); white light, 2 s on, 2 s off. 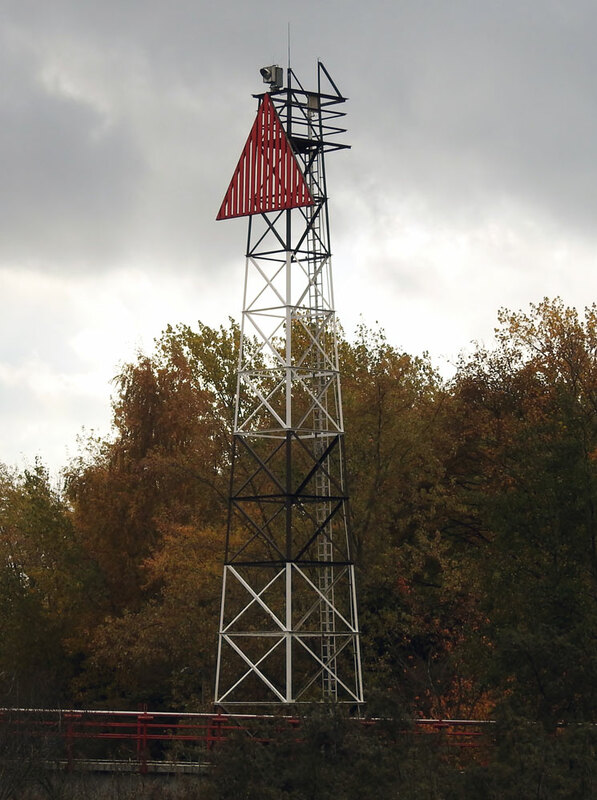 24 m (79 ft) square skeletal tower painted white and carrying a red triangular daymark, point up. Trabas has a photo, and Google has a satellite view. This range guides vessels into an industrial harbor on the east side of the Warnow. Located in a field east of the Peez chemical complex. Site status unknown. Admiralty C1421.6. 1984. Active; focal plane 35 m (115 ft); white light, 2 s on, 2 s off. 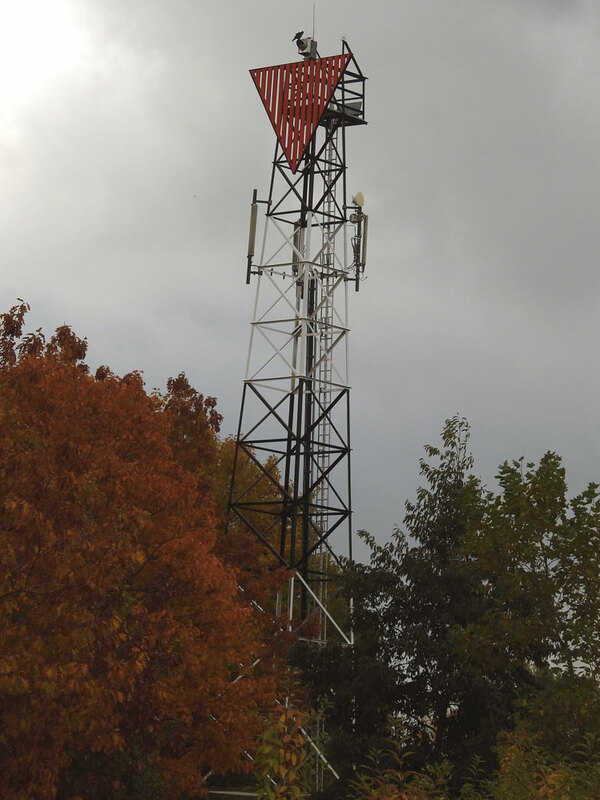 33 m (108 ft) square skeletal tower painted white and carrying a red triangular daymark, point down. Trabas has a photo, and Google has a satellite view. This range guides vessels into an industrial harbor on the east side of the Warnow. Located in a field 450 m (1/4 mi) east of the front light. Site status unknown. Admiralty C1421.61. 1990 (station established 1903). Inactive since 1997. 9 m (30 ft) hexagonal metal tower with gallery, colored with red and white horizontal bands. Frank Guschmann has a good photo, a more distant view is available, and Google has a satellite view. 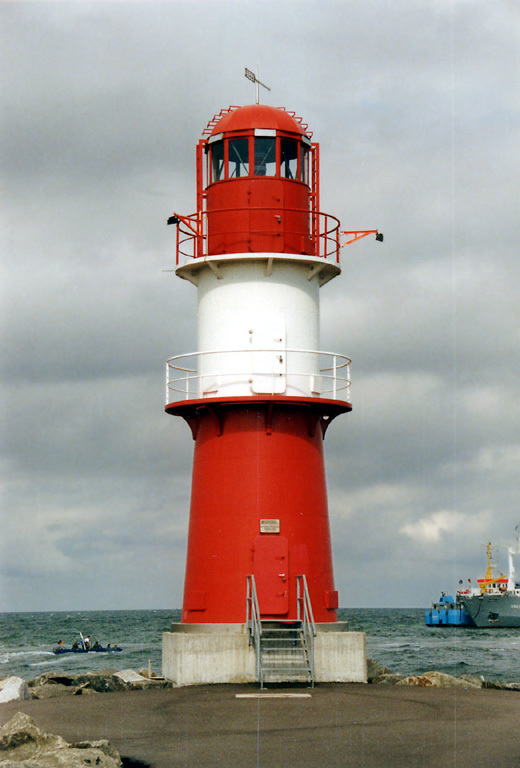 This light was prefabricated in Rathenow, a town in Brandenburg west of Berlin, and installed on the middle mole of Warnemünde. 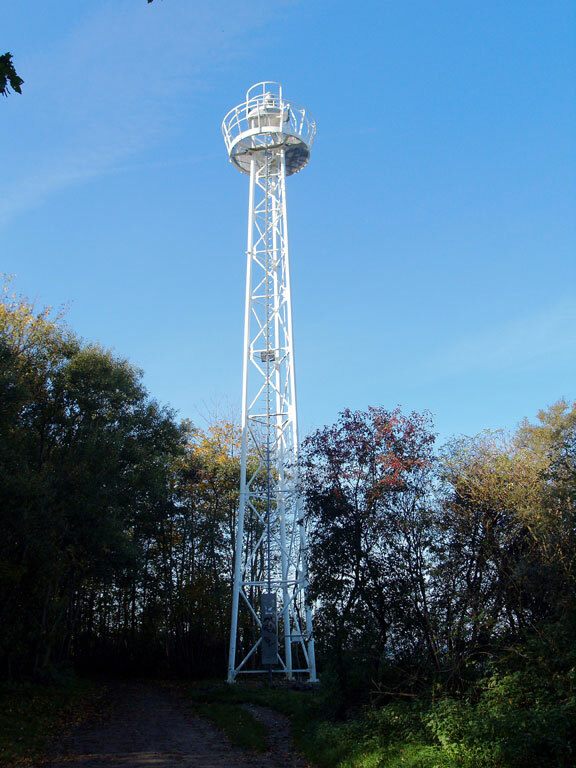 Deactivated and removed in 1997, the tower was stored by WSA Stralsund. In 2008 it was returned to Rathenow, where it has been placed in a quiet loop of the Havel River adjacent to the downtown area. Huelse has a good postcard view of the original Mittelmole lighthouse, and Michel Forand has a second postcard view. Accessible only by boat, but easily seen from every angle. Site open, tower closed. ARLHS FED-255. Plau am See (2012); this resort town on the Plauer See (Lake Plau) in northern Mecklenburg has a lighthouse as part of waterfront development. Visitors can climb to the lower gallery. Jürgen Evert has a good photo, Jürgen Treiber also has a photo, and Google has a satellite view. Posted April 9, 2005. Checked and revised February 23, 2019. Lighthouses: 24. Site copyright 2019 Russ Rowlett and the University of North Carolina at Chapel Hill.